In January, the St John Palmerston Cadet Division was ecstatic to discover they had won the City of Palmerston’s Citizen of the Year award within the category of Community Event of the Year! The Cadets were awarded their prize on Australia Day at the City of Palmerston’s official Australia Day ceremony. This event was hosted at the Palmerston Recreation Centre from 1pm and with an invitation for everyone in the community to attend the significant day, celebrating what makes Australia so special. The Cadets received their prize alongside the other winners Serena Dalton (Citizen of the Year) and Jessica Bartlett (Young Citizen of the Year). The Palmerston Cadet Division has a dedicated team of adults, Cadets (aged 12 to 18 years) and Juniors (aged 8 to 11 years). Six enthusiastic adults lead the group in training, supporting and encouraging the Cadets and Juniors. Our Cadets and Juniors are trained in age-appropriate first aid that enables them to give back and participate in the wider community by providing first aid at a range of public events. Cadets are encouraged to participate in as many events as they can, with most members completing over 60 hours a year. In 2017, the Palmerston Cadet Division spent a combined 1,805 hours serving the Top End community at public events, ranging from the Bombing of Darwin to Palmerston Carols. Though 26th January is a day of celebration across Australia, for Katherine residents in 1998 - it was a time of distress and loss. 20 years ago on Australia Day weekend, a low pressure system over the Gulf of Carpentaria developed into a Tropical Cyclone, devastating the region. It was the town's worst flood in half a century, claiming three lives and making refugees of 5,000 people. At its peak, the floodwaters covered more than 1,000 square kilometres of the Territory. Many lost everything. St John Ambulance NT crews and volunteers did everything possible to help during this time, setting up a temporary hospital in the only room available at the Katherine Police HQ and working twenty hours per day or more; either on the ambulances, from helicopters on rescue duties or at one of three evacuation centres. These centres catered for up to 600 people each. Though thinking back on that time will still be difficult for many Katherine residents to this day, we at St John Ambulance NT want 26th January to serve as a reminder of the importance of pulling together as a community and helping each other in times of crisis. Did your grill skills need some first aid on Australia Day? 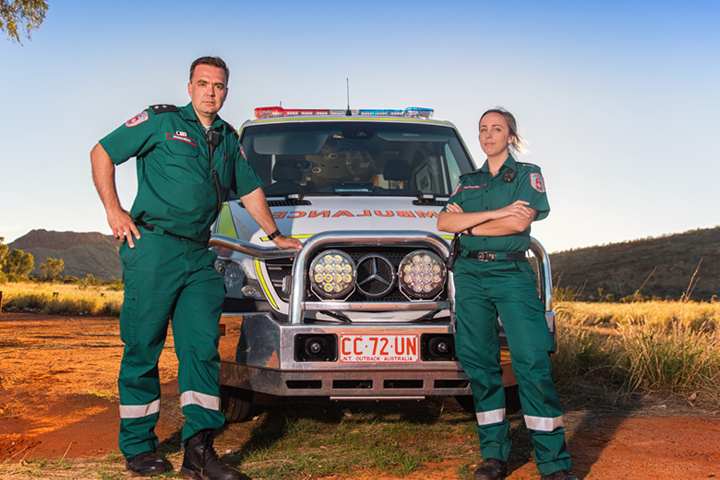 From everyone at St John Ambulance NT, we hope you all had a fantastic Australia Day and an enjoyable time was spent with friends, family and loved ones. We decided the holiday was a great opportunity to give away some St John Ambulance NT goodies in a Facebook competition which encouraged the public to confess their embarrassing BBQ mishap stories and share them with us all. Congratulations to Paula Martin whose hilarious story won her a $200 Woolworths gift card and a St John Ambulance Small Leisure Kit and Burns Module, well done Paula! All proceeds from the sale of First Aid Kits are used to support our volunteers and their activities in our community, and for that we'd like to send a BIG thank you to our customers!